Rahu-Ketu affect destiny and fate and are at times considered the strongest of all the nine planets manifesting deep thoughts and desires ingrained in our minds. While Rahu ensures we experience karma that is due to us, Ketu causes detachment though usually through pain. Rahu is the giver while Ketu takes away. Hence their transits are important as they impact us profoundly. They tend to unfold our karma quite suddenly throwing us off track. When we reach out and pacify them they do protect us. To find out how this transit might affect you. What you can expect and what should you do to sail through this period. Order our Rahu Ketu Transit Report now. Subscribe to the Transit Puja Package and get pujas done every month on your nakshatra throughout this transit period. 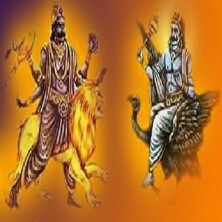 Rahu Ketu Preethi Homam to enhance the benefits and alleviate any malefic effects during this transit which lasts for one and a half years will be performed on 14th February 2019. This is being done in accordance with the Vakya Panchangam followed by temples. Astrologers usually follow the Thirukanidha Panchangam and hence the transit dates will differ.